The Rosahl PD screw-in micro dehumidifier is designed for simpler, faster installation, where the dehumidifying membrane fits inside an M12 moulded (M12 x P0.5 fine-pitch) screw-in fitting and is suitable for enclosures up to two litres (122cu in). 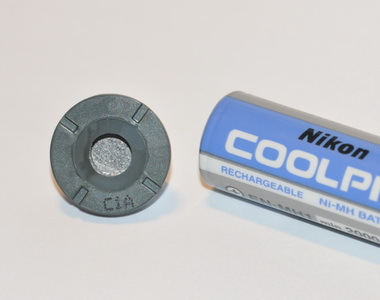 Only a quarter the size of an AA battery, the flange diameter is 17mm and length 11mm. They can be installed in a case with a threaded hole, or fitted with a suitable locking ring when uses in a punched/drilled hole. The electrical connections are made inside the case. The PD is a solid state, screw-in dehumidifier powered from a 3V dc source. It is silent in operation, drain free, maintenance free, has an average power consumption of 80 mW, and has a long service life.The standard version is model PD3 which uses push-on electrical connectors. 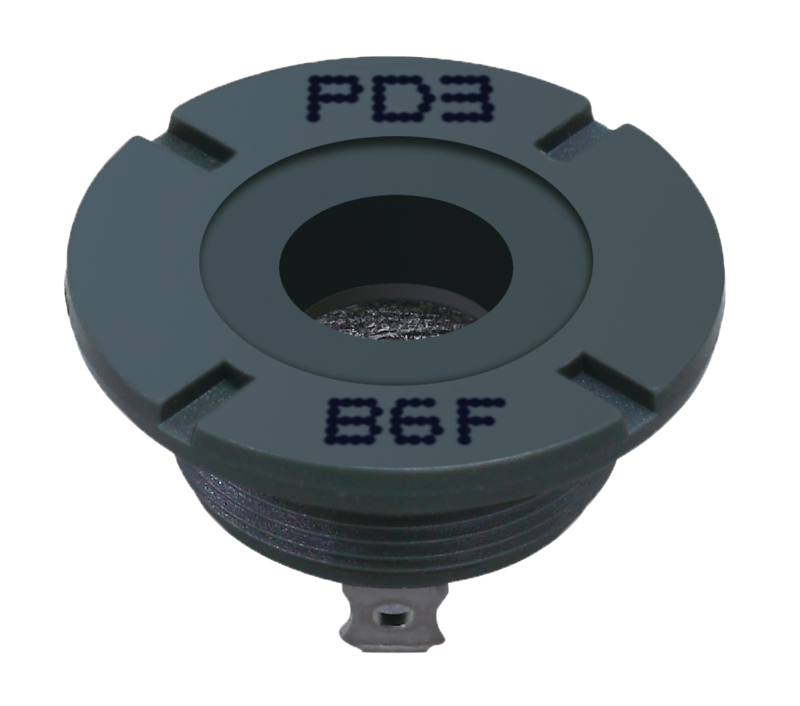 Type PD2 has soldered connectors and is available on request. Where a screw-in mount is not suitable the RD Series offers a flat bolt-on profile dehumidifier, also for enclosures up to two litres and measures 24 x 30 x 5.5mm. The standard version is model RD3 which is designed to be mounted on the outside of the enclosure. Model RD4 is almost identical but designed to be installed inside the enclosure to be dehumidified. 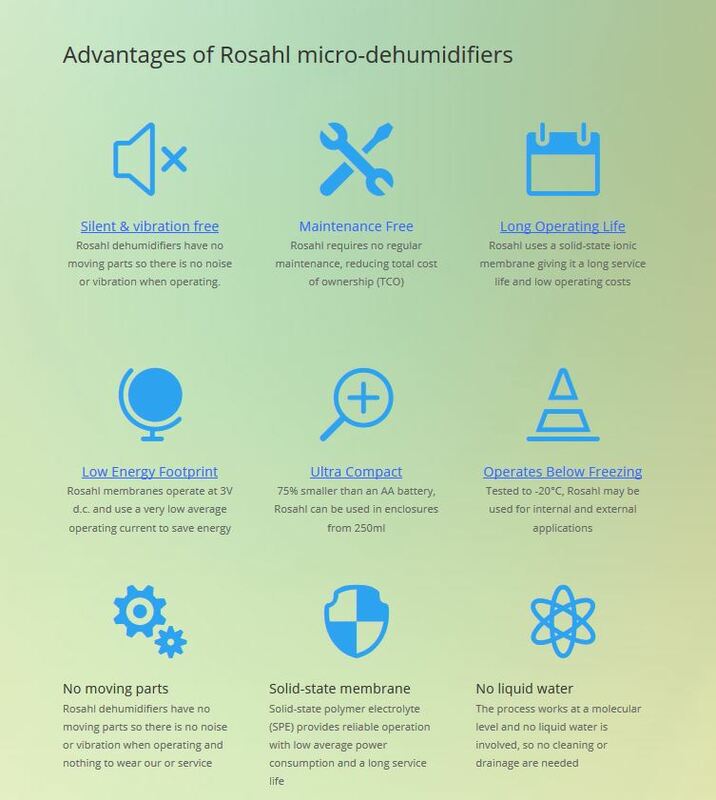 Rosahl also makes a several ranges of larger flat-panel dehumidifiers to reduce condensation problem in enclosures up to 4m³. Go here for a range overview.